Welcome to Ironstone Pickups, some of the best guitar pickups for value, tone and customer service. Every set hand finished and tested in Ironstone’s Rutland workshop. A professionally hand wired, fully tested scratchplate / pickguard, with unique pickup switching. 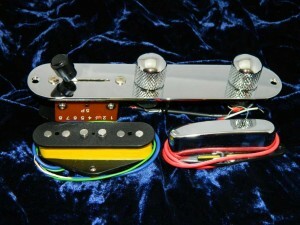 Ironstone also offer a 5 way Telecaster control plate and pickup set. A range of guitar products to compliment our pickups, including; Pre amp / multi FX unit, and Stratocaster and Telecaster assemblies. 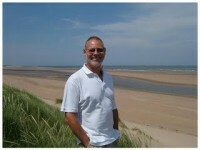 Customer service and technical support are a big part of the Ironstone 'package'. Use the Support tab for free articles and advice on a wide range of guitar topics. 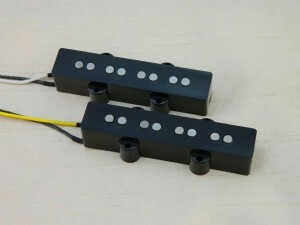 Electric Guitar Pickups by Ironstone. Welcome to the Ironstone Home page, featuring our range of Stratocaster (Strat), Telecaster (Tele), Humbucker, Bass and guitar products. Every single pickup we sell has been hand finished and individually tested in Ironstone’s Rutland workshop. Some of the best guitar pickups for value, tone and customer service. Please note; Ironstone is currently closed until Saturday May 18th. Order placement will not be possible over this period. 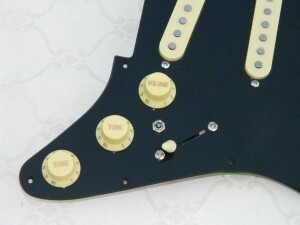 A fully loaded Gilmour 'Black Strat' Stratocaster scratchplate assembly with unique custom pickup switching. 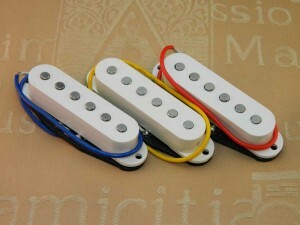 Assembled with your choice of any Ironstone Stratocaster pickups. Leaving just a simple 3 wire connection to your guitar, the scratchplate showcases both the original tone of your Ironstone pickups and adds 'Bridge in Series' and 'Neck in Parallel' switching to the normal 5 way selector, a total of 10 different tones. Colour options available for plate, pickup covers and controls. Scratchplate now available with 'Bridge Blend' option as an alternative to the standard Neck in parallel functionality (at no extra cost). Both options get you the classic Gilmour 'bridge and neck in parallel' tones, just by different switching! 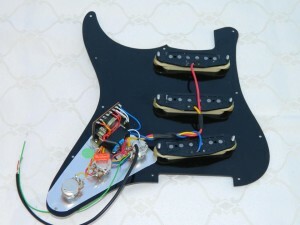 For more details, check out the Gilmour Scratchplate Wiring page, or contact us via the contact page for more details. "...took the guitar to the gig last night & it truly rocked! 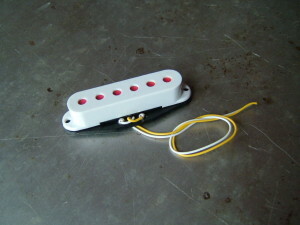 Your p/ups have turned a nice Squier into a truly great guitar..."
Stratocaster guitar pickups from Ironstone. Five styles and five vintage Strat tones, all featuring Alnico V (and III) magnets; Silver, Gold, Platinum, Hybrid & Origin. 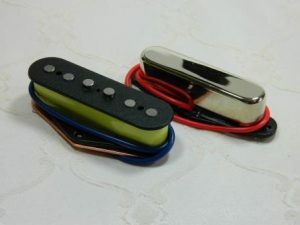 "....just fitted the pick-ups and they are great, I just turned a £100 Tele' into a £400 Tele' in 20 minutes...."
Telecaster electric guitar pickups. Warm vintage tones, with that unmistakable Tele 'Twang'. Features mixed Alnico 3 & V magnets and a rose copper bridge back plate.
" ...the pickups just arrived, the sound is exactly the same I've heard on expensive PAF replacements..."
Stunning PAF style 4 wire Humbuckers. 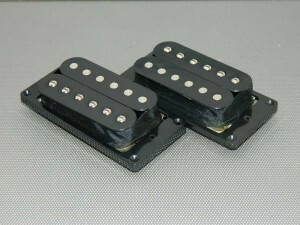 High output 15.5K , open-frame Alnico V pickups available individually or as a set, complete with full mounting kit. A fully loaded 'Black Strat' Stratocaster scratchplate assembly with your choice of Ironstone Stratocaster pickups and unique custom pickup switching offering a stunning range of tonal options. "The latest, flagship vintage Strat pickups from Ironstone"
Classic 50's and early 60's tones - no compromise: For all playing styles and Artist tones from the fabulous early Fender era of the 50's and early 60's. Designed to recreate the warm, clear bell-like tones from a combination of original design specifications with a very modern mixed magnet twist. The Telecaster 5 way set - a pair of Ironstone pickups and a custom hand-wired 5 way switching control plate, allowing the normal 3 pickup selection plus series configuration and a simulated 'out of phase' mode. "What an amazing gadget. 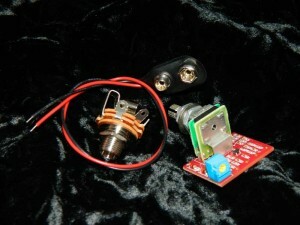 Works perfectly, like a guitar Supercharger"
A guitar pre-amp to light up your guitar's tone. Suitable for use with Ironstone or any other pickup system, this on-board guitar pre-amp effects PCB gives 4 stages of switchable gain and true bypass. 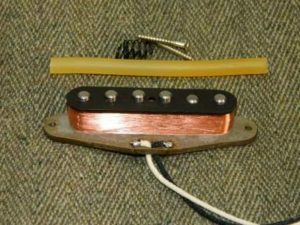 These Jazz Bass pickups are 'old school' construction, with fibre bobbins, Alnico V magnets and vintage push-back wiring. The result is a warm vintage sound, but with the 7.2K bridge and 6.6K neck delivering a clarity of tone that balances rich full bass with crisp treble detail. Also separately available is the Jazz Bass Dummy coil system, a simple solution to the normal Jazz Bass hum issue.